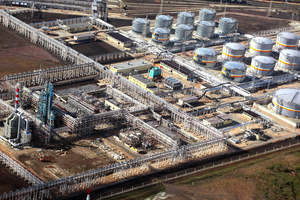 LONDON--(Marketwire - Feb 26, 2013) - Invensys Operations Management, a global provider of technology systems, software solutions and consulting services to the manufacturing and infrastructure operations industries, has successfully completed the first phase of a main automation contractor project at the new Yaysky oil refinery in Kemerovo, a city in Russia's Kuzbass region. Under the terms of the multimillion dollar agreement, Invensys, as the main automation provider, has supplied complete control and safety solutions, including field instrumentation, process analytics and valves. Included in the project are the company's Foxboro® distributed control system, Triconex® emergency shutdown systems and Foxboro measurement and instrumentation solutions, as well as new Foxboro visualization and configuration tools. The company will also provide comprehensive installation, engineering, development, support and on-site training services. During the execution of the project Invensys played a key role in the selection of suppliers and contractors, managing the supply chain and improving the efficiency and transparency of pricing to optimize the total cost of ownership of the project. NefteKhimService JSC, a Russian company and investor in the Yaysky project, selected Invensys as the MAC after an open-vendor bid in 2009. "We were looking for an experienced partner, someone who could help us reduce risks, lower costs, accelerate startup and drive profitable performance sooner, and we believe Invensys can deliver," said Alexey Medvedev, IT director of NefteKhimService JSC. "Invensys were our partner throughout every stage of the project, showing great competence and responsibility as the general contractor for the applied technical solutions, as well as managing all the work within the project. Their real-time control, safety and instrumentation solutions will help us meet the strong, growing demand for gasoline and diesel fuel in the Kuzbass region without compromising our commitment to safety, quality and sustainability." "We are extremely pleased to serve NefteKhimService JSC on this important project, and we are totally committed to their success," said Boris Muratov, general manager, Invensys Operations Management, Russia. "Along with the industry's broadest portfolio of open technology solutions, Invensys has more than 100 years of global experience completing massive projects for companies large and small. The Yaysky project builds on our abilities to help refineries around the world become safer and more efficient, as well as strengthens our strategic position in Russia's growing, dynamic downstream market. "For this project, Invensys went beyond the traditional vendor-supplier scope of work and focused on the priorities and needs of the customer in the broadest sense of the word. This was truly a joint effort that involved teams from across the complex, from studying optimal technical solutions at the development stage to the hard work at the delivery, installation and commissioning stage. We look forward to working with NefteKhimService JSC to help Yaysky become a world-class refinery." The Yaysky facility is designed to process 3 million tons of crude oil per year. After start up, it will annually produce more than 400,000 tons of gasoline and 1.5 million tons of diesel fuel, satisfying more than 60 percent of the fuel consumption needs of Russia's Kuzbass region, located in southwestern Siberia. The successful first phase sets up the refinery for the next two phases of implementation, which will expand production to 6 million tons of crude oil per year and increase oil conversion to 93 percent. Invensys Operations Management, a division of Invensys, is a leading provider of automation and information technology, systems, software solutions, services and consulting to the global manufacturing and infrastructure industries. Headquartered in Houston, Texas, its solutions are used by more than 40,000 clients around the world in more than 200,000 plants and facilities. Invensys Operations Management's offerings are delivered under several prominent industry brands, including Avantis, Eurotherm, Foxboro, IMServ, InFusion, SimSci-Esscor, Skelta, Triconex and Wonderware. The company's approximately 9,000 employees and its global partner ecosystem integrate these products and services to help clients collaborate across systems and enterprises in real time, extracting critical data to make faster, better decisions and synchronize their operations from the plant floor to the executive offices, aligning production goals with business objectives. To learn more about Invensys Operations Management, visit iom.invensys.com or the Innovate@IOM Social Community. Experience the value of Enterprise Control -- linking business strategy to production execution -- at www.infusionjourney.com. Invensys, the Invensys logo, Avantis, Eurotherm, Foxboro, IMServ, InFusion, SimSci-Esscor, Skelta, Triconex and Wonderware are trademarks of Invensys plc, its subsidiaries or affiliates. All other brands and product names may be trademarks of their respective owners. Invensys has successfully completed the first phase of a main automation contractor project at the new Yaysky oil refinery in Kemerovo, a city in Russia's Kuzbass region.